Wondering what you can do to get your family ready for November? 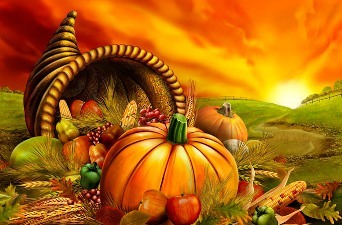 Decorate the house with leaves and turkeys and pilgrims. Trace your kids’ hands, cut them out, and have the kids write what they’re thankful for on them. Glue the thankful hands to a turkey so they form the turkey’s feathers and use it as a Thanksgiving decoration. Start a family gratitude journal for everyone to use. You can decorate it together or just place a plain journal on the kitchen table. Invite everyone to jot down what they’re thankful for every day. On Thanksgiving, take a moment and let everyone read their favorite entry. One day, set out to talk about the little things you’re thankful for. Show the kids as you fix breakfast or drive them somewhere how to be thankful for the smallest of blessings. (“I’m thankful for your smiles this morning.” “I’m thankful that the sun is shining today.” “I’m even thankful for the piles of leaves we have to rake up!”) Explain that when we show thankfulness for the small things, we’re showing God we’re grateful for everything He gives us and we know that all—big or small—comes from Him. Choose a family verse for November and post it on the refrigerator. Let one of the kids do a keyword search on Bible Gateway, find verses about gratitude, and have each family member choose one to memorize this month. Thankful time is coming! A month of gratitude sets the scene for the season of giving—so make the most of it, as a family. Great ideas! We some similar things in November. The kids's an I make a thankful jar, we decorate it and set a bowl of little scrap pieces of blank paper next to it. From nov 1st until Thanksgiving day we all write things we are thankful for on the little papers then put them on the jar. By thanksgiving the jar is full and we read the papers during thanksgiving dinner. We all love it and it has become a tradition in our home! I love the thankful hand turkey idea. I think we will do that this year as well. You always have great ideas Laura. I like the family journal idea -- think I'm going to roll with it! I love your ideas. I'm looking forward to doing a gratitude meme throughout November. I hope all is well, and that you had a happy birthday.